The 1500 year old Danza de los Voladores of the Totonac Indians. &quot;Los Voladores&quot; (the Flyers) is a 1500 year-old rite sacred to Quetzalcoatl, the Morning Star. From its origins on the Gulf coast of Mexico, the ritual spread throughout Mesoamerica: a special square was reserved for it in Tenochtitlan, the Aztec capital, and a variant is still known among the Quiche' Maya in Guatemala. Today &quot;Los Voladores&quot; is best known in its original home in the Huasteca region, especially among the Totonac, who have lived in the area for millenia. 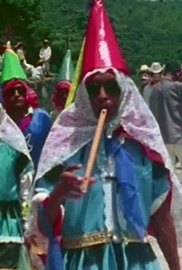 The version shown in the film is from Huehuetla, in the Sierra Norte de Puebla.